Samidoun Palestinian Prisoner Solidarity Network stands in solidarity with the National Prison Strike launching on 21 August in jails across the United States. This important struggle, involving work stoppages, sit-ins, boycotts and even hunger strikes, is a critical confrontation of racism, capitalism and oppression taking place in the center of the U.S. prison system. The dates of the strike are not accidental; instead, they underline the political legacies that have inspired and continue to push forward the movement. August 21 marks the 47th anniversary of the assassination of imprisoned revolutionary and Black Panther George Jackson. His writings, “Blood in My Eye” and “Soledad Brother,” not only inspired prisoners trapped in the racist U.S. prison system to resist and revolt but were translated around the world. Jackson’s own revolutionary perspective was deeply informed by internationalism. As explored in depth by Professor Greg Thomas in his exhibition, “George Jackson in the Sun of Palestine,” writings by Palestinian poet Samih al-Qasim were found in his cell after his assassination. Al-Qasim’s writings about imprisonment, identity and resistance to colonialism and Zionism found resonance and reflection in the writings, thoughts and organizing of an imprisoned Black Liberation struggler. The prison strike is a workers’ struggle and a freedom movement. In an institution erected on the framework of chattel slavery and on confiscated Indigenous land, “modern-day slavery” is a common practice. Prisoners, especially and disproportionately Black people, are forced to work for tiny sums of money. Their imprisonment itself provides profits to prison corporations, while their labor is exploited by some of the nation’s largest corporations for superprofits. This is one reason why the prison strike focuses so clearly on the exploitation of labor and on the power of those workers to withdraw their labor to enforce their demands. The U.S. prison system incarcerates working class and poor people, especially Black people and people of other oppressed communities. The “school-to-prison pipeline” criminalizes young people, directing them into a future of incarceration, oppression and exploitation. The deeply racist nature of the U.S. prison system and the massive and devastating effects it has had on Black communities in particular reflect the nature of capitalism and settler colonialism in the United States, built on the genocide of Indigenous people. Prisons do not function separately from capitalism; instead, they work to ensure the perpetuation of capitalism and its imperialist advances against the people of the world. This is a reason why Black Liberation, Indigenous and other movement leaders are targeted specifically for criminalization, accompanying the mass incarceration of entire communities. The use of incarceration by the United States in order to achieve its objectives to control, suppress and manipulate populations is not confined to its borders. Indeed, the U.S. funds the military imprisonment of Palestinians by the Israeli settler-colonial regime just as it supports the incarceration of resistance leaders and freedom fighters in countries around the world that stand against U.S. imperialism. The U.S. uses “anti-terror” laws to spread fear among oppressed communities and imprison those who struggle for the rights of their people – or even provide charity to the oppressed, as in the case of the Holy Land Foundation Five, the Palestinians sentenced to up to 65 years in prison for their charitable work. The following statement was released by the Palestinian prisoners of the Popular Front for the Liberation of Palestine, jailed by Zionist colonialism for their role in struggling for the freedom of their people. They are among nearly 6,000 Palestinians imprisoned by the Israeli occupation today. Their solidarity comes to extend fists of resistance and hands of unity through prison bars to support the U.S. National Prison Strike, beginning August 21. We write today as imprisoned Palestinians of the Popular Front for the Liberation of Palestine, held in Israeli jails for our participation in struggle for the liberation of our land and people from colonialism and occupation. Today, we extend our solidarity to the prisoners in the jails of the United States participating in the national prison strike beginning on August 21, fighting exploitation, racism and capitalism from within the heart of imperialist prisons. The prison strike is a struggle of oppressed and exploited workers, first and foremost, confronting the unmasked brutality of capitalism behind bars. Around the world, prisoners have only protected their human rights and won victories through struggle. We know that you are demanding improved conditions, the right to fight in court for your rights and an end to excessive, lifelong sentences. You are also demanding an end to the new form of slavery found in U.S. prisons, where prison workers are paid pennies to produce goods and perform services for some of the country’s largest corporations. We also salute your struggle against racism. U.S. settler colonialism and imperialism practices its vicious racism both internally and externally, and the prison system reflects that reality. Black communities, Latino communities, Arab communities are under attack, facing mass incarceration and a system that seeks to imprison and exploit rather than support and nurture youth and elders. Today, prison workers are some of the most exploited workers in the United States, and the same ruling class that profits from the confiscation of Palestinian land and resources and from the bombing of children in Yemen also profits from the forced labor of prisoners. Your struggle is a workers’ struggle that is part of our global conflict against the vicious exploitation that our peoples face today. This struggle inside the prisons highlights the deep connections between racism and capitalism and how the struggle against them both can never be de-linked. The boycott campaign that is part of your strike also emphasizes the critical role of boycott in confronting exploitation and oppression. While our circumstances and lives may vary greatly from one another in many ways, we too face economic exploitation through a “canteen” system that seeks to profit from our imprisonment as Palestinians. We know that prison profiteers in the United States also profit from prison canteens, phone calls and other purchases, and we salute your campaign of boycott. This is the same reason why we call on people around the world to join the boycott, divestment and sanctions movement against Israel. We cannot and must not be the consumers of those who profit from our misery and oppression. As you enter your strike, we salute all of you and your struggle, and we urge all who are not already committed to join in the strike. We extend a special revolutionary salute to the imprisoned strugglers of the Black Liberation Movement and other liberation movements, including Mumia Abu-Jamal, whose consistent internationalism and principled struggle is known and resonates around the world. We demand the freedom of these freedom fighters in U.S. jails, from Leonard Peltier to Mutulu Shakur. We know from our experience that it is through struggle and confrontation that true freedom can be realized. Your strike is being launched within the heart of U.S. imperialism, the greatest danger faced by our Palestinian people and the people of the world. 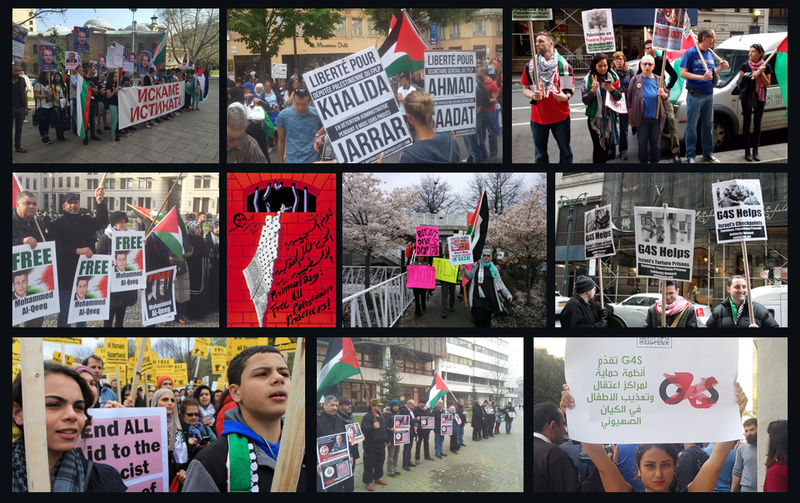 We know that your victory will also be a victory for Palestine – just as our victories in Palestine will be a victory for all of the struggles against imperialism, racism and oppression in the United States and globally. 25 August, Manchester: Rolling picket protest - Free Palestine! Boycott Israel!